Tony Gilroy is a decent writer and filmmaker whose long list of accomplishments does not need a special introduction. With his resurrected script of “Beirut”, there was a hope that we might finally get something as cool as “The Bourne Identity” or “Michael Clayton”. Something that will make us sit tight and enjoy watching an intelligent story. 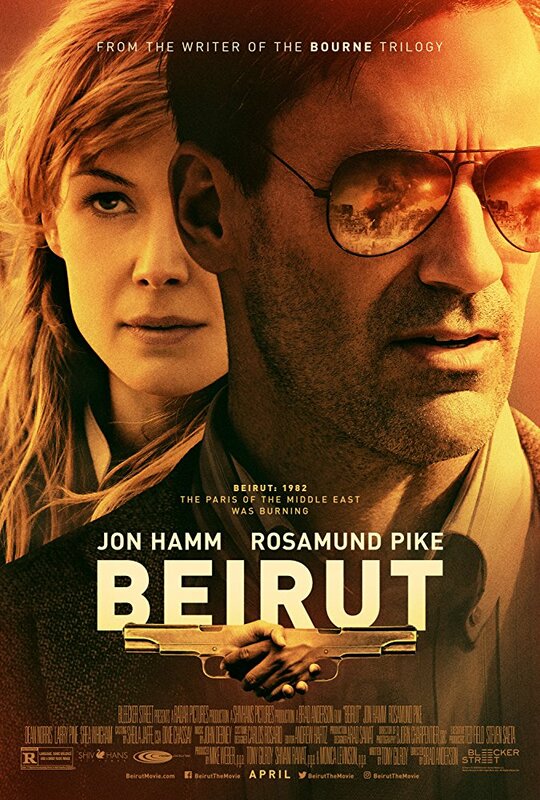 In fact, “Beirut”, directed by Brad Anderson and starring Jon Hamm and Rosamund Pike does exceed the expectations. It maybe falls a bit short of its aim but is still an enjoyable political drama that won’t require much knowledge from the viewer. You won’t get lost in the politics and is definitely worth to give it a shot. The film opens in Beirut in 1972. A U.S. Diplomat-turned-into-a-spy Mason Skiles (Jon Hamm) is hosting a VIP party at his luxurious house in Beirut. His best friend Cal (Mark Pellegrino) shows up delivering the shocking news: a boy named Karim whom he aided at his house is the brother of Raffikk – one of the most wanted terrorists. As Mason tries to use his negotiating skills to keep Karim out of trouble, things go awry. Shooting begins inside the house that leaves his wife murdered and Karim taken away by his elder brother. Ten years after that tragic event, Mason is no longer a first-class negotiator. Now he is fully concentrated on disputing the labor settlements. One day, a man approaches him in a bar offering him money and a first class ticket to the destination he’d never wish never get back to – Beirut. Still unsure about what’s waiting for him in the city, Mason agrees to take off just to find out that his friend Cal is being held as a hostage and he is the only one who can set him free. In conclusion, “Beirut” is a political drama that provides to a viewer everything one anticipates to see in a movie of this genre. It is a light action drama which is mainly based on valuable conversations. The plot is predictable but it seems it was never intended to be otherwise.